The divergence between the long term and short term forecasts that became apparent las week continues. My take on September housing permits and starts is up at XE.com. 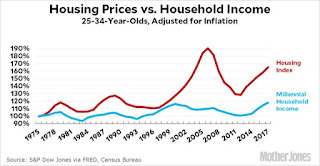 I have a fundamental difference of opinion from Bill McBride a/k/a Calculated Risk as to whether the drivers exist for significant continued growth in the housing market during this expansion. For the last month, I deduced a "hurricane adjusted" number for initial claims, which showed that the previous underlying positive trend was intact, with the four week average remaining in the 230,000's. That approach was borne out by this week's report, which, at 222,000, was the lowest since 1973. Since the seasonal adjustment last week was only ~6%, (244,000 vs. 229,289 NSA), this means last week's "hurricane adjusted" number was on the order of 239,000 or 240,000. Natural disasters will continue to strike. I am confident that the method I used in 2012 after Sandy, and again this past month, is a good way to distill the underlying trend from the disaster disturbance. 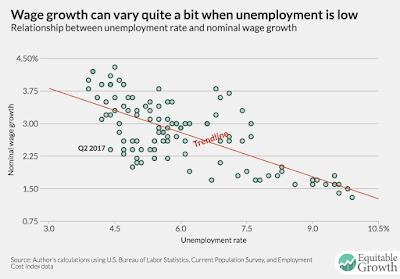 Sluggishness in core inflation in advanced economies—a surprise in view of stronger than expected activity—has coincided with slow transmission of declining unemployment rates into faster wage growth. Real wages in most large advanced economies have moved broadly with labor productivity in recent years, as indicated by flat labor income shares (Figure 1.4, panel 6). As shown in Chapter 2, muted growth in nominal wages in recent years partly reflects sluggishness in labor productivity.1 However, the analysis also reveals continued spare capacity in labor markets as a key drag: wage growth has been particularly soft where unemployment and the share of workers involuntarily working part-time remain high. 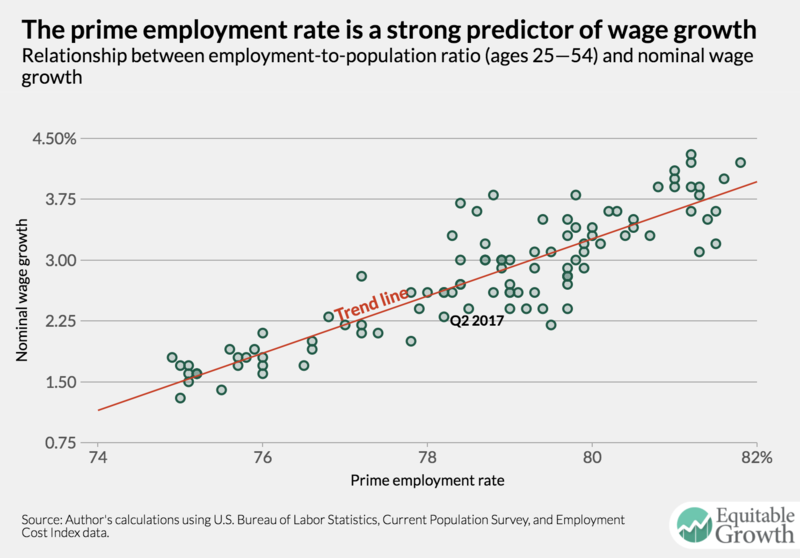 The corollary of this finding is that, once firms and workers become more confident in the outlook, and labor markets tighten, wages should accelerate. 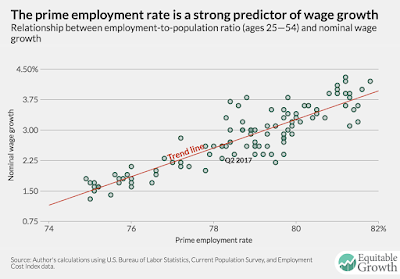 In the short term, higher wages should feed into higher unit labor costs (unless productivity picks up), and higher Sluggishness in core inflation in advanced economies—a surprise in view of stronger-than expected activity—has coincided with slow transmission of declining unemployment rates into faster wage growth. Real wages in most large advanced economies have moved broadly with labor productivity in recent years, as indicated by flat labor income shares (Figure 1.4, panel 6). The above chart shows the absolute number of employees working part-time for economic reasons. The total number -- after 8 years of economic growth -- is only now returning to the heights of the previous expansion. This chart (better known as the U-6 unemployment rate) presents the information in a percentage format. This statistic was 10% at the beginning of 2016, which was the highest level of the previous recession. But during this expansion, we hit this level a full seven years after the recession ended. That's quite a delay. The excerpt from the IMF report adds two key pieces to this puzzle: First, the US is not the only country experiencing weak labor utilization and a corresponding weak wage growth. In fact, The IMF strongly implies this also seems to go hand-in-hand with the weak pace of global inflation. Second, the IMF has research that links these two concepts. A few weeks ago, I suggested a hurricane workaround for industrial production. That approach was to average the four regional Fed indexes excluding Dallas, and add the Chicago PMI, and finally discount for the unusual strength this year in these regional indexes vs. production. The average of the 5 is 22.9. Dividing that by 5 gives us +.5. Subtracting .3 gives us +.2. We can be reasonably confident that underlying trend in industrial production in September, despite the hurricanes, has been positive. That's the good news. The bad news, of course, is that even with this improvement, the big (revised) August decline of -0.7% in production, and -0.2% in manufacturing has not been overcome, and production is still below where it was this spring. If we were to apply the same workaround for August as we did for September, however, the forecast would have been a manufacturing reading of +0.2% for that month as well. That would be enough to put us slightly above where manufacturing production was earlier this year. Indeed, the Fed suggested that but for the hurricanes, September would have been +0.25% higher. So despite the softness in industrial production the past few months, I believe the overall trend remains slightly positive and not suggestive of any underlying downturn in the economy. The top chart shows the overall industrial production index, which peaked in the first half of 2014, dipped and has since risen a bit. But it is still about the same level as the last expansion's peak. 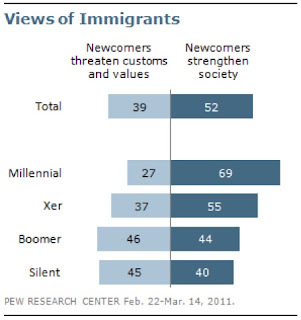 The bottom chart explains why. When we break the index down into market groups, we only mining (above in green) has done well. Manufacturing (in blue) and electricity production (in red) have been trending sideways since early 2012. NAFTA was put into force at the beginning of 1994, which, coincidentally, is when the two charts above begin. The top panel shows total US exports to Mexico, while the bottom shows total US exports to Canada. Between the years 1994 and 2017, total exports to Mexico increased 8 fold while those to Canada were up 3 fold. In other words, there were also clear winners on the US side. There are problems with trade -- there always are. But there are also benefits, which have been greatly overlooked over the last few years. Here is something I have been working on for the last month. 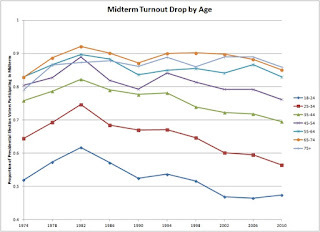 As it happens, last week Kevin Drum posted some aspects of the same data. 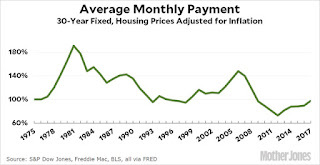 This is because, while the prices of houses have increased, mortgage interest rates have decreased over the same period. 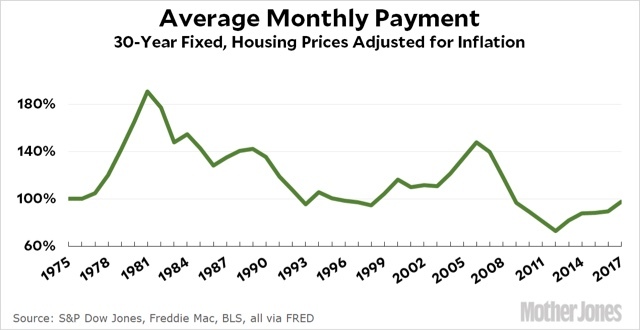 So, saving for the down payment is considerably more difficult (unless, e.g., parents are helping out), but once the house is bought, the monthly carrying cost for living in the house really hasn't gone up at all. 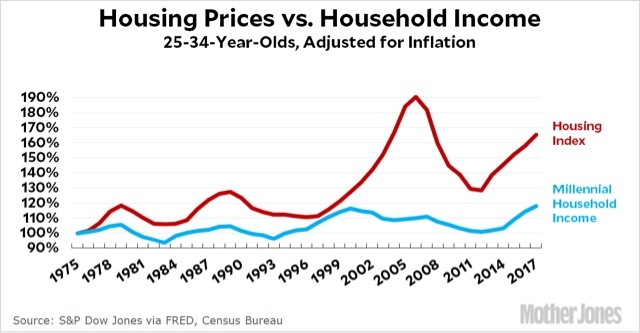 What's missing in this discussion is comparing both household income and mortgage payments to the alternative (leaving aside living in mom and dad's house) of paying rent. I still have some number crunching to do, but once the three way comparison is finished, it will be a really illuminating look into how much the alternatives for shelter really cost. Stay tuned. Is This Why Wages Are Low? These are two graphs from a post over at the Center for Equitable Growth. 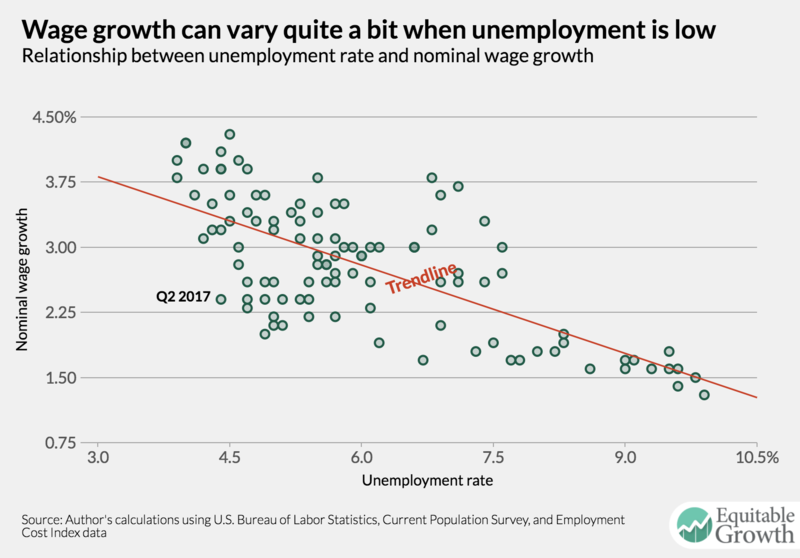 The top chart shows that the relationship between unemployment and wage growth isn't as strong as you'd think. Recent research highlighted by Fed President Bullard made the same observation. But the bottom chart -- now that's what a tight correlation looks like! The correlation was .68 -- pretty high. It's still low; it only just attained levels seen at the low of the last recession, meaning this analysis could be on to something. 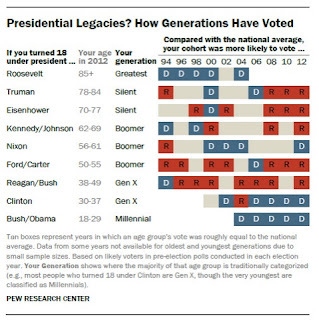 The US looks like government of, by, and for senior citizens. President Donald Trump just had his 72nd birthday. He assumed office at age 71, the oldest person ever to do so. In Congress, Senate Majority Leader Mitch McConnell is 75 years old. His Democratic counterpart, Charles Schumer, is a relatively spry 66. The median age of US Senators is 63. A full 30 Senators are age 70 or older. Sixteen of them are over 75. Nine are over 80! The oldest, Diane Feinstein of California, is 84 years old and just announced that she intends to run for re-election. Should she win, by the end of her term, she will be 91 years old -- if she survives. The average life expectancy for an 85 year old woman is 6.9 years. In other words, she will have nearly a 50% chance of dying in office before she completes her term. In the House of Representatives, Speaker Ryan is the baby of the group at age 47. Democratic Minority Leader Nancy Pelosi is 77. The average House member is 57 years old, the oldest average ever. Over 30% of the Members are age 65 or older. Over 15% are over 70. Twelve Members are over 80! The median age of Justices of the Supreme Court is 67. Two Justices are over 80. One is 79. In the 19th Century, the average Justice served about 10 years. Now they sit on average close to 25 years. In short, the majority of the leadership of all three branches of the US government are old enough to collect Social Security and Medicare. 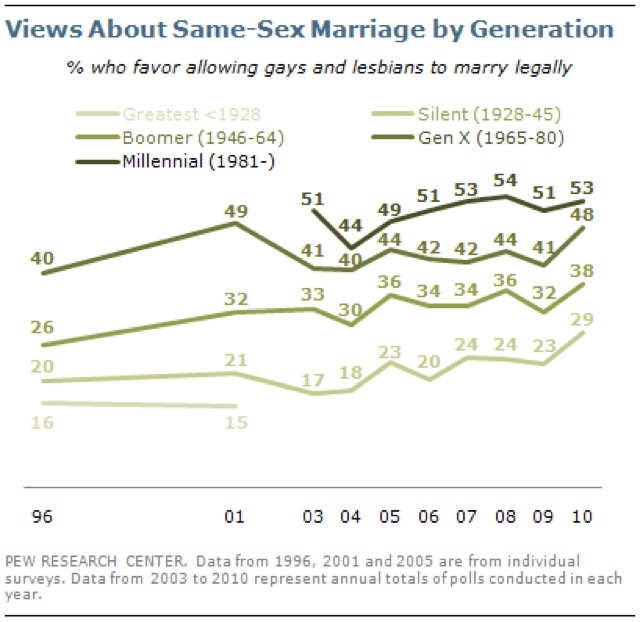 Forget Boomers, most of the US leadership belongs to the Silent Generation, and formed their basic political opinions in the 1950s during the days of Ike and Senator Joseph McCarthy, and when court-ordered racial integration was just beginning. And it shows. 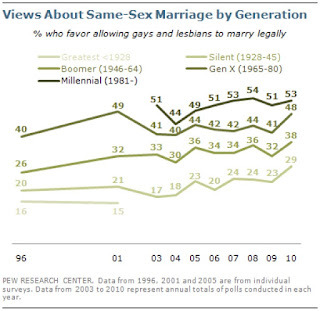 these are the age groups who are having their views enacted. 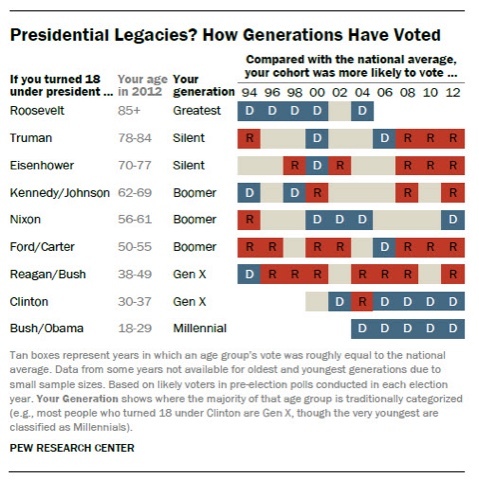 While, as the chart shows, the late "Greatest Generation" leaned blue, but they have almost all passed from the scene. 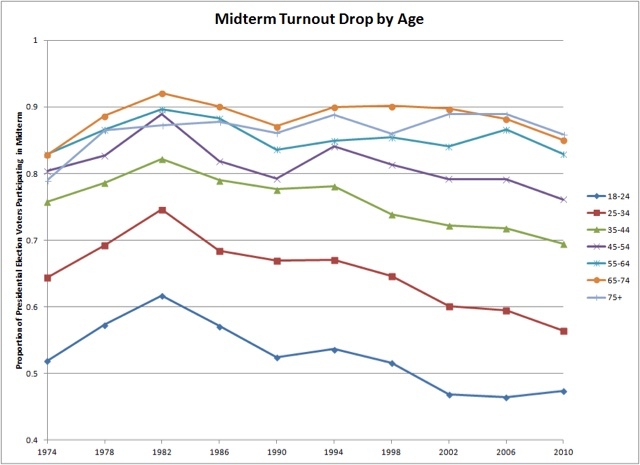 Thus the midterm elections have been dominated by an extremely conservative electorate. They have elected people in their own age group. And the politicians they elected are serving their interests. This is government of, by, and for the elderly: rule by gerontocracy.